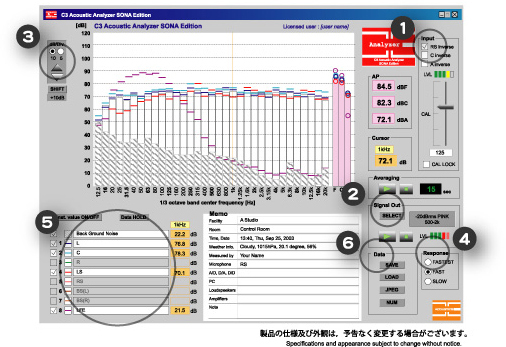 By calibrating analyzer before measurement, you can measure at the right sound pressure level (SPL). This tool is equipped with "inverse characteristic filter". A noise level meter, which does not support signal output at F characteristic, can measure at flat response. You can output measurement signals, such as Pink Noise, White Noise. Without extra Noise Generators, you can start measuring with ease. The display scale of graph can be adjusted according ro a measurement range. Switchable display updates speeds. You can adjust this function at appropriate speed for observing the monitor characteristics. You can save measurement results of each channel in memory. The memory supports the measurement of 7.1 channel. Each channel has its display updates speeds switched. You can save measurement results and the data of parameter values in memory. The data files can be imported for confirming the measurement result obtained in the past.